The history of music publisher Josef Weinberger goes back to the late Victorian era. He founded his publishing business in Vienna in 1885, mainly licensing stage works from the fields of Classical music. Over the years his company expanded into many more music genres, with its associated sound library “JW Media Music” as a leader in its field. Already at the beginning of the 1970s, JW Media started to produce countless vinyl LPs in the UK, presenting hundreds of tracks in various musical stylings on their record labels “JW/ Theme Music”, ”Programme Music” and “Impress”, as specially commissioned music for inclusion into radio, tv, movies or advertising. One of the early and maybe most influential compilations of British library music was released in 1994 on the Trunk label, entitled “Super Sounds of Bosworth”, raising great interest and enthusiasm among producers, DJs and record collectors. 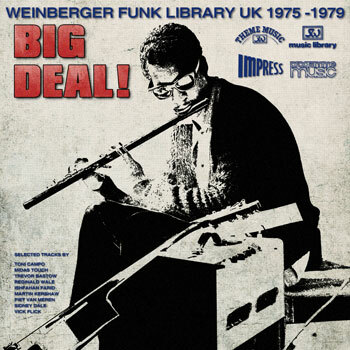 The only comprehensive set of eight recordings from the Weinberger archives was put together in 2002, surprisingly as part of the Strut compilation ”The Bosworth Library Sessions”. With this new sound collection from the vaults of Josef Weinberger, we dig deeper into the fascinating library music of Toni Campo, Midas Touch, Trevor Bastow, Vick Flick, Sidney Dale and other uncommon musicians, who used to work behind the scenes, usually composing for various music production companies. They are responsible for some of the most exciting library music ever recorded. 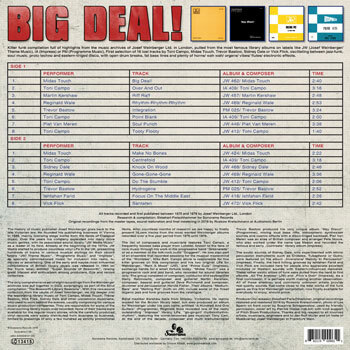 None of their tracks were available for the regular music stores, while the carefully produced vinyl records were solely distributed from business to business, limited to pressings of only a few hundred as strictly promotional items. After countless months of research we are happy to finally present 16 rare tracks from the most wanted Weinberger albums recorded over a five year period from 1975 until 1979. The list of composers and musicians features Toni Campo, a frequently booked bass player from London, known to the fans of rock music through his work in the progressive band “Greenslade” or as a member of the folk-rock outfit “Doggerel”. He was also part of an ensemble that recorded sessions for the musical mastermind of the “Wombles”, Mike Batt. Campo alone is responsible for five killer grooves on this compilation and his two original LPs for Weinberger, “Rent A Mood” (JW) and “Prime Cuts” (Impress), exchange hands for a small fortune today. “Midas Touch” was a progressive rock and jazz band, who recorded for sound libraries only. The group consisted of composer, conductor and keyboardist Harry Rabinowitz, composer and guitarist Martin Kershaw, composer, bassist and guitarist Dave Richmond and composer, drummer and percussionist Harold Fisher. Their albums “Medium-Rare” and ”Melting Pot” (both on JW) include some of the finest organic jazz and funk grooves from the catalogue. Band member Kershaw hails from Shipley, Yorkshire. He mainly worked for the Bruton library label, but also produced an album for Weinberger under his own name, entitled “A Hundred And One Guitars” (Programme). Reginald Wale recorded one of the really outstanding “Impress” library LPs, “go-go-go!/ rhythm-rhythm-rhythm!”, featuring the world-renowned jazz musician Tony Carr. At the end of the decade, composer and multi instrumentalist Trevor Bastow produced his very unique album “Hey Disco!” (Programme), mixing loud bass riffs, atmospheric synthesizer sounds and cosmic effects with a disco-tinged backbeat. Piet Van Meren was an alias of British composer and arranger Pete Moore, who also worked under the name Lee Mason and recorded the famous and early „Contrasts“ library album (Impress). The exotic sounds of Sidney Dale, who experimented with ethnic percussion instruments such as Crotales, Tubaphone or Guiro, were featured on his album „Inversions/ Melody In Percussion“ (Impress). Finally, the hard hitting grooves by Ishfahan Farid and Vick Flick are included here for people who appreciate excellent mixtures of Western sounds with Eastern-influenced melodies. These rather exotic slices of funk were pulled from the hard to find albums „All The Arabias“ (JW) and „Flick`s Own“ (Impress). As a final conclusion, it is perhaps worth making another observation: All of these shadowy and commonly unknown artists provide real quality sounds that come close to the best works of the funk genre, as this first Weinberger compilation, now finally available for everybody to enjoy, should prove. cover art by Patrick Haase (rab.bit) with kind support of Pitch Down Productions. Ring Musik & Musikverlag Josef Weinberger in Frankfurt/ Main.